Is sibling rivalry a developmental phase? 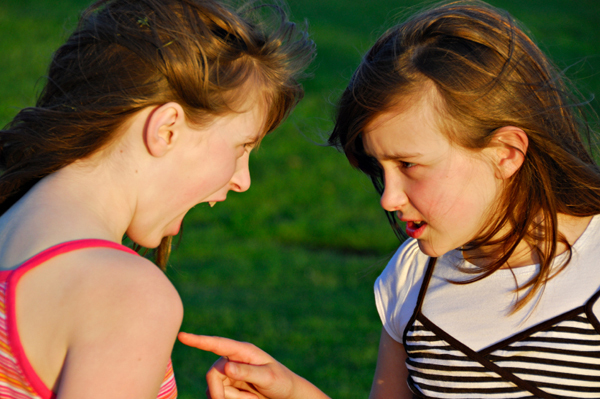 Is sibling rivalry a developmental phase that all siblings go through? In every conflict, there are at least three sides: one side, the other side and the truth somewhere in the middle. When two of the sides are siblings, there maybe even more sides. Even though sibling rivalry is, to a certain extent, a fact of most kids’ lives, there are times when it is not what it seems. What you may be attributing to sibling rivalry may really be developmental issues, personality traits or even the sign of something else entirely. Before attributing one behavior or another to sibling rivalry, be sure that addressing it as such is the right thing — because it may be something different. As with many other parts of parenting, you can’t expect your kids to act or react in developmentally inappropriate ways. You have to consider age and developmental stage when applying discipline, making requests and using “logic.” Therefore there are times, especially dealing with your younger children, when you must ask yourself whether what you are construing as sibling rivalry is more appropriately attributable to a developmental issue. For example, your 2-year-old may be extremely frustrated by his inablity to express himself and may react to a situation by bopping his sister on the head. Is that scene of conflict really about sibling rivalry? Or is it about your 2-year-old’s frustration — and his sister just happening to be a nearby, easy target? It doesn’t mean you don’t discipline in this situation — bopping his sister still isn’t right — but you may handle it differently. Each of our kids has their own unique personality. The traits that make up a personality have their pluses and minuses. Your child who is particularly stubborn and headstrong can be exasperating at times, but on some level you know that that child will never be taken advantage of as an adult. Conversely, your child who is particularly sweet and unassuming may cause you the opposite worry: how to teach him or her to stand up for themself. In light of this, think about what you see as conflict between your kids, what you label sibling rivalry. How much of it is true rivalry and how much of it is each child’s individual dynamic being played out? What can be parented in terms of sibling rivarly, and what can be parented individually as appropriate to each child’s personality? There are times when what gets acted out in a sibling conflict situation has nothing to do with either age, development stage, personality or the sibling relationship — and everything to do with something external to all of it. If home and family is a “safe” place where acting out is, if not accepted, at least where life stress is allowed to come out, it stands to reason that issues from the outside world may be released there. Especially as your child gets older, look for patterns in sibling conflict. If, for example, your middle schooler always seems to pick an argument with your other child on Thursday afternoons, look at what’s happening on Thursdays that might be causing your middle schooler some stress. Then try to address that stress. If, no matter what you try, sibling rivalry is increasingly difficult for all of you to manage, it’s time to ask for help. There’s no shame in this! Interpersonal relationships are hard, and sibling relationships are particularly important! Ask your child’s pediatrician for ideas and/or a referral to someone who can help your whole family manage the sibling (and family) dynamic for the long-term health of all your relationships. Sibling rivalry, though common, should be just a part of life, not a focus. It may take time to figure out the source issues, and they may not be sibling-based. But the effort to help your children — individually and as a set — have healthy and strong relationships is a valuable and rewarding effort.